The 2019 winners of AIA’s COTE Top Ten are all about education and connection to place. There is a bittersweet irony in celebrating a sustainable design award for the renovation of a major cathedral a mere week after Notre-Dame de Paris was devastated by a fire that was started, according to initial reports, by renovation activities. An ambitious new law makes progress towards NYC’s goal of 80% carbon reduction by 2050 by setting aggressive carbon emission limits for nearly all NYC buildings over 25,000 square feet. Platinum used to be the ultimate LEED rating. Not anymore. A new program, LEED Zero, asks project teams to show a year’s worth of data proving zero impact in at least one of four categories: energy, carbon, water, or waste. PVC from China is some of the worst in the world, but it’s being imported into the U.S. at astounding rates. This and other interesting facts are covered in depth in a new study from the Healthy Building Network (HBN). Achieving the goals of the Green New Deal will be tremendously challenging—but not impossible. Responding to marijuana legalization in Canada and multiple U.S. states, U.S. Green Building Council (USGBC) has announced numerous changes to ensure the LEED standard stays current with changing demographics among cannabis users. 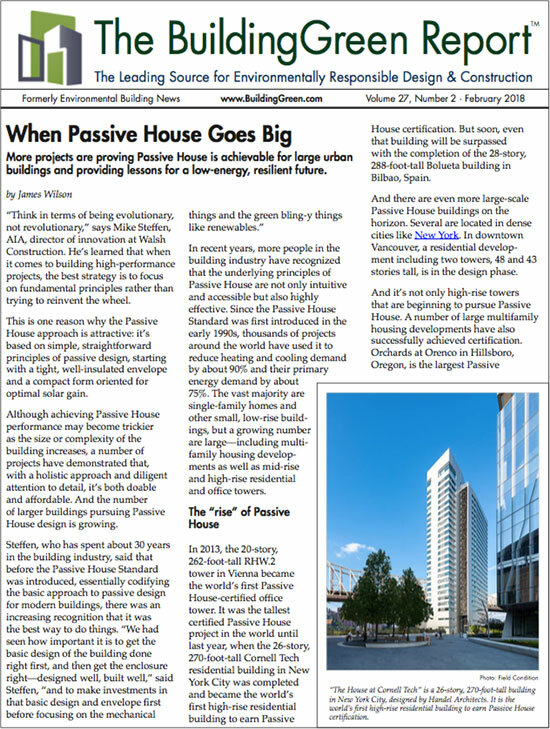 Mass-timber buildings with Passive House-level performance. All-electric energy systems with renewables and storage. Green stormwater infrastructure. Advanced occupant-engagement strategies. A new “field guide” to becoming a regenerative practitioner suggests starting with oneself. Sustainable development involves minimal disruption of living things and natural systems, but regenerative development is different: it aims to enhance the ability of life to thrive. If this seems difficult, don’t despair: a new guide offers advice on how to become a “regenerative practitioner.” And it all starts with your inner life. Ready to expand your comfort zone? Handing control to occupants is the best way to ensure they’re satisfied. This article builds on a 15-year-old BuildingGreen classic, originally written by Jessica Boehland and Nadav Malin. Our update includes exciting new work going on with thermal comfort in mixed-mode buildings. Quotes from 2019 interviews are marked as such. Hanging Gardens offers a “smart” blue-roof system that stores water on roofs, monitoring weather and local stormwater to more effectively manage runoff.